Forums - Bricks in Motion » Contests & Festivals » EASTER 2019 Contest Starts NOW! Topic: EASTER 2019 Contest Starts NOW! Welcome to the EASTER 2019 Contest From 2011 to 2015, EASTER was an annual contest to celebrate spring and the spirit of Easter by spending two weeks holed up in a dark room animating! But sadly there was a four year hiatus between the last EASTER and now.... but here we are in 2019 with yet another EASTER Contest! And this time, EASTER is an official Bricks in Motion contest. The deadline for this contest is April 20th, 2019 at 11:59pm (midnight) EDT. You can see the countdown timer and convert to your time zone here. This means you have a full two weeks to create your entry. You entry must be Easter related in some way. However, it does not have to be religious (unless of course you want it to be). However, try to think outside of the box with your film. There are so many things to do with this theme; I want you to be as creative as possible. Copyrighted material (music, themes, etc) are allowed, but originality is strongly recommended. The film may not contain any mature/explicit content. This includes, but is not limited to: swearing, excessive/gory violence, overt sexual content, and blatant drug references. However, slapstick comedy is allowed. Only one entry per person will be accepted. If you submit more than one entry, only the last entry will be considered. Videos must be uploaded to the internet to submit. You can submit videos to YouTube, Vimeo, DailyMotion, Flickr, or other video sharing sites. To submit your entry, please send the link to your video to me either in a email (recommended!) or through a forum Private Message. Do not post links to your entries in this topic. Entries may be public or unlisted when submitted. Films will be judged based on Originality, Production (animation, cinematography, sound, etc. ), and Story. However, the films will be judged primarily as a whole. The whole is always greater than the sum of the parts! The part everyone's excited about! 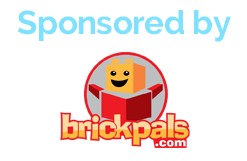 This year, BrickPals.com has been so kind as to sponsor us in order to make this contest as TRANSCENDENTAL as possible! 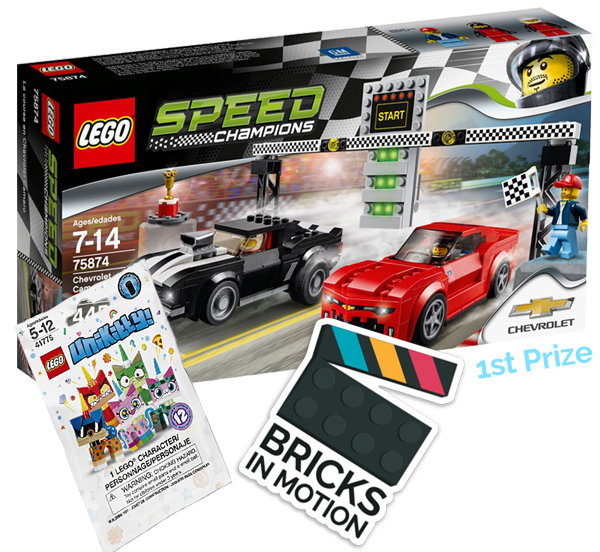 LEGO Speed Champions 75874 Chevrolet Camaro Drag Race, 1 LEGO Unikitty Random Collectable Character, and 1 Bricks in Motion Vinyl Sticker! 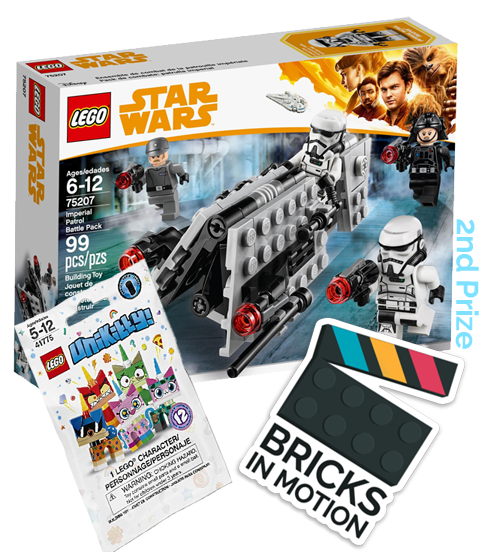 LEGO STAR WARS 75207 Imperial Patrol Battle Pack, 1 LEGO Unikitty Random Collectable Character, and 1 Bricks in Motion Vinyl Sticker! 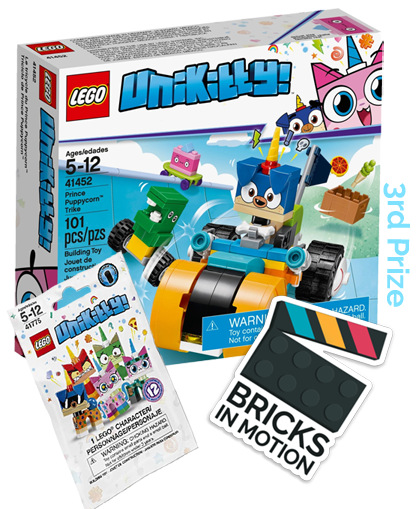 LEGO Unikitty 41452, 1 LEGO Unikitty Random Collectable Character, and 1 Bricks in Motion Vinyl Sticker! If you have any questions, do not hesitate to reply to this topic! I'm excited, and I hope you are too! Re: EASTER 2019 Contest Starts NOW! Do we need any mod elements? Entries must contain the EASTER 2019 image or the text “Made for EASTER 2019” somewhere in the film. Very exciting, can't wait to see the content created from this competition! Any particular reason for the 20 second limit? Is it possible to get the new BiM logo too? As Brickman said, you do not need mod elements! Only include the words "Made for EASTER 2019" or the EASTER 2019 logo (linked in the topic post) somewhere in your film and you're good! In previous years, we had a 15 second time limit, but in 2015 I bumped it up to 20. It's mainly just to challenge you creatively, but since the contest is only 2 weeks, it makes the challenge seem a lot more manageable to entrants. While Youtube or Vimeo are preferred, Facebook, Instagram, and Twitter will work as well, as long as the video is public at the end of the contest. I am very excited about this! 2nd contest, thanks for this opportunity! 20 seconds, different, but I think it will allow for creative and focused entries. I like it! If I put the Easter logo in my video does it count as part of the twenty seconds? Brickman is right, the total length has to be a maximum of 20 seconds. A subject line isnt important, but since it's required for BiM, just put "EASTER 2019, [username]" and send the link in the message. Sorry I got it right this time. Just submitted my first ever entry to a BIM contest; good luck everyone! I run a non-profit, YouTube-based Brickfilm Archive and sometimes produce Brickfilms of my own. Loving the entries so far! Can’t wait to see them all! Entered! Can't wait to see the results!